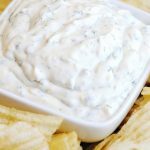 Here’s a delicious and easy Sour Cream Chip Dip recipe for your next party, get-together, or game day. It uses a full 16-ounce container of sour cream, plus four simple ingredients that you probably have in your pantry. In a bowl, combine all ingredients until well blended. Chill in the refrigerator for at least an hour, but preferably 2 hours or more. Serve with potato chips or cut veggies. Store in an airtight container in the refrigerator for up to 5-7 days. Can also be made with 1 cup sour cream and 1 cup mayonnaise, rather than all sour cream.